9034 ESS WALLIS & FUTUNA (1960) Kava ceremony*. Trial color proofs in strip of 5. Scott No 155, Yvert No 157B. 18422 ESS WALLIS & FUTUNA (1960) Native dancers with paddles*. Trial color proofs in strip of 5 with multicolor. Scott No 157, Yvert No 158b. 3910 ESS WALLIS & FUTUNA (1962) Shellfish diver*. Trial color proofs in strip of 5. Scott No C16, Yvert No PA19. 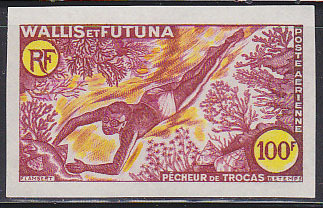 16012 ESS WALLIS & FUTUNA (1962) Shellfish diver*. Trial color proof. Scott No C16, Yvert No PA19. 3902 ESS WALLIS & FUTUNA (1976) de Gaulle*. Trial color proofs in strip of 5 with multicolor. Scott No C46, Yvert No PA48. 3906 ESS WALLIS & FUTUNA (1980) de Gaulle*. Trial color proofs in strip of 5 with multicolor. Scott No C104, Yvert No PA106.